A new kind of Mech. Titanfall has finally been revealed as Respawn Entertainment's debut title. At E3 2013 the first-person shooter was shown off behind closed doors and I got the opportunity to check out the hands-off demo. The demo was essentially a longer version of what was shown during the Microsoft press conference. During that demo, Respawn explained that Titanfall is a game balanced between mechs, or Titans, and their pilots. The two playstyles are completely different, and using one or the other offers unique strategies that haven't been seen in a modern first-person shooter before. The demo began with our squad jumping out of an aerial transport ship in an effort to protect the Red Eye capital ship while it refueled. In order to protect the ship, we had to capture and hold up to three different points from the Interstellar Manufacturing Corporation (IMC). To help out in the fight, players can call down Titans about a minute after the match begins. Once on the field, Titans add a new element of gameplay. If a player chooses to hop in to a Titan, they'll become a death machine. Titans aren't the clunky mechs you might be used to. Instead, they're agile and extremely quick, on top of being equipped with amazing amounts of firepower. Along with being able to punch and stomp enemies with massive force, they can use magnetic powers to catch bullets midair and send them flying back at their opponents, or fire missiles that deal tremendous damage. Additionally, when players choose to hop out of their Titan for one reason or another, the Titan will automatically go on guard duty and defend their pilot from harm. Respawn wants combat between Pilots and Titans to be completely different. While Titans are quick and strong, Pilots are fast too and can wall jump to reach locations inaccessible to the burly Titans. If a Titan is brought down in battle, players have to wait two minutes in order to call down another one. There also seemed to be different types of Titans, as one was seen using a pulse-rifle while another wielded a heavy machine gun. The match went on for about twenty minutes, and once victory was achieved the pilots had to book it to their aerial transport ship. Everyone in the demo shouted, "Get to the chopper!" and with seconds left, the pilot ejected himself from his Titan and gracefully landed on the ship's deck. Graphically, Titanfall looks incredible. The next-gen title is crisp, detailed, and beautiful. Hopefully there will be a great story to go along with the unique gameplay, but we probably won't hear much about that for a while. 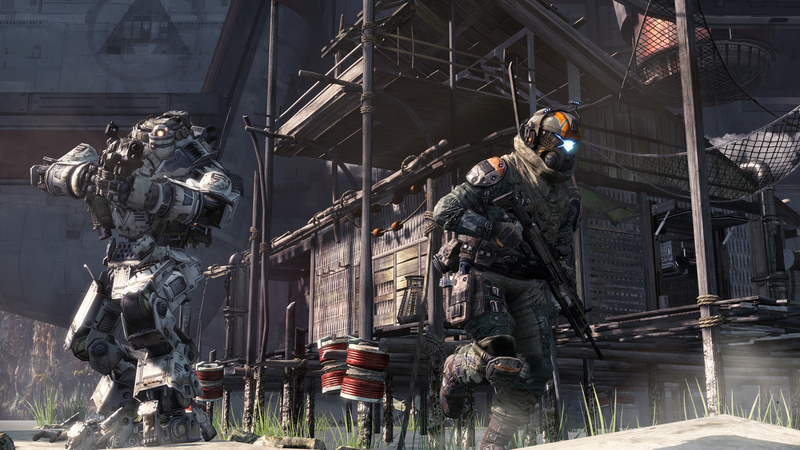 Titanfall is coming to Xbox One and PC in Spring 2014.